One of my favorite film credits of all time is found at the beginning of the movie Fargo. We see the words, “This is a true story.” We then see a bizarre story of kidnapping and murder. And then, in the credits at the end of the film, there’s the usual disclaimer that none of what we saw was true at all. It was all in fun for the Coen brothers, who wrote and directed the film. The same trick was famously used for The Blair Witch Project, which used an elaborate internet campaign (when the internet was all new) to sell itself as a film made with “found footage.” Don’t mean to spoil things for you, but it was all pretend. All kinds of exorcism films make the “truth” claim, including this week’s The Rite (2011), which is promoted as “inspired by a true story,” but the end credits don’t disavow the claims. 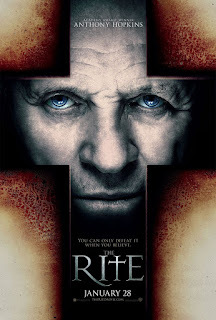 In fact, the end credits note that Father Lucas Trevant (played by Anthony Hopkins) has performed over 2,000 exorcisms, and Michael Novak (played by Colin O’Donoghue) is one of 14 Catholic exorcists in the United States, working out of Chicago. The vast majority of exorcists in films are Catholic priests. 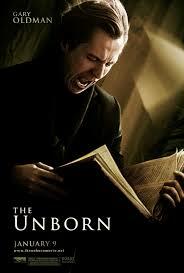 The film The Unborn had an exorcist Rabbi (Gary Oldman) with an assist from an Episcopal priest (Idris Elba), but that’s an exception. The Rite begins with Novak living at home with his father, a mortician. Their house doubles as a mortuary, so one can understand Novak’s desire to move on. The priesthood is the most affordable option he can imagine. Michael takes admissions tests and does well. He scores highest on psychology and art history and not so well on theology, which seems like it might be a good thing for a priest to understand. Before taking his vows, Michael does have some questions about becoming a priest, such as, does he believe in God and such. Those seem like kind of important questions, but one night one of the priests from the seminary barely avoids getting hit by a car. The car swerves and hits a woman. The woman sees Michael’s collar and asks for last rites. He comforts her and gives her the rites (in a rather moving scene). Michael considers dropping out of the priesthood because of his lack of faith, but his superior suggests that instead, he should go to exorcism school in Rome. The classes are taught by Father Xavier, but when Michael expresses his doubts about the reality of demon possession, Xavier sends him to see Father Lucas who is described as a Jesuit, Welsh, and unorthodox. Michael watches Lucas treat a 16 year old pregnant girl. Michael asks if the girl doesn’t simply have psychological issues, but Lucas tries to convince him by having the girl perform a mindreading trick (like the fortune telling slave of Acts 16). Lucas tries to learn the demon’s name, but the demon is unwilling to co-operate. Lucas tries to drive the demon out, but explains that the process can take weeks or even years. The exorcism does not go well; the girl become violent, choking Michael. Eventually this woman is hospitalized, and Father Lucas is called in. The woman takes her own life, and , needless to say, Father Lucas is discouraged. And then Father Lucas is himself possessed by a demon. We see him slap a little girl in a park when she approaches him and asks to have her doll blessed. It is, of course, up to Michael to exorcise Father Lucas. Seeing the devil in Lucas brings Michael to believe in the Devil, but also in God. He drives out the demon using the traditional ritual. The ritual uses Psalm 91, which was also used in The Unborn. It seems to be the go to Psalm for exorcism. The exorcism for Father Lucas is successful. Michael really believes now and has found his calling. We don’t have to sort out truth from fiction here at Movie Churches, we just take the church as it is on the screen. 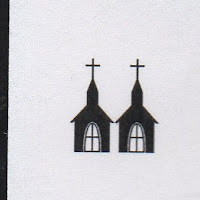 So while I was impressed by the orthodoxy of the exorcism ritual, claiming the power of the Blood of Jesus for forgiveness and the power of the Resurrection, the chance of a priest being possessed earns some demerits. 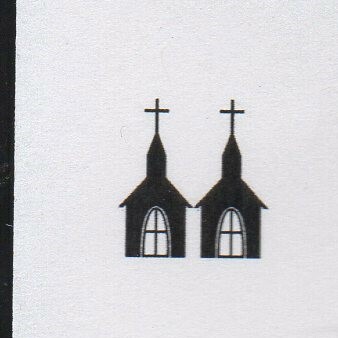 So we’re giving the Church in The Rite just two steeples.